Mexican President Enrique Peña Nieto presented his second State of Union earlier this week. Despite the tradition to address Federal Congress at the Palacio Legislativo de San Lázaro, Peña Nieto’s statement took place at the Palacio Nacional in front of almost 1000 guests, including 400 media representatives. The expectation was for Peña Nieto to praise his government and the Federal Congress for achieving the so awaited structural reforms and especially to highlight the political collaboration of all major forces in both chambers thanks to the famous Pacto por México. For the first time the President of Mexico was welcomed and accompanied by the president of the Senate (Senator Miguel Barbosa) and the president of the Chamber of deputies (Silvano Aureoles MP), who are both from a major opposition party, PRD (Partido de la Revolución Democrática). 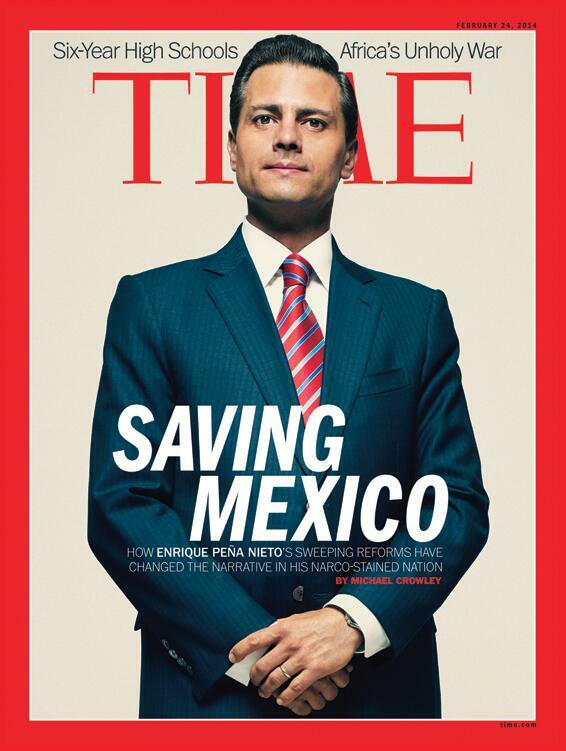 Yet Peña Nieto chose to underline the future projects that his administration will undertake. The first one is the construction of a new international airport in Mexico City, which will be located not far from the current one. It will have six air strips with annual capacity for 120 million passengers, becoming one of the largest airports in the world. In the voice of Peña Nieto the new airport will become a ‘landmark of modern Mexico’. The second project is to extend Mexico City’s public transport system. The expansion of four metro lines represents 43.5 kilometers more of network and 20% of additional capacity. And finally, the transformation of the social program Oportunidades into PROSPERA. * This new face of social assistance will maintain the current support provided by Oportunidades but will also offer further coverage for vulnerable social sectors. PROSPERA seeks to create alternatives to incorporate citizens into economic activities and at the same time will enhance the government’s poverty alleviation efforts. It seems that Peña Nieto has been able to create a political consensus around his initiatives. Although the reforms have been approved and as EPN mentioned “reforming is transforming… the reforms were easy, but transformation must follow its course…” Implementation and the long term outcomes are the difficult part, which are still to come. But beyond the support of the political class, does Peña Nieto have the support of the population? Recent polls show that more than half of the population disagrees with EPN’s administration. EPN and his government appear to realise the changes of Mexico’s socio-economic landscape and intend to address the increasing demands of the population. On the one hand, PROSPERA targets lower and rural classes and on the other hand the infrastructure projects target urban middle classes. Some political experts believe that this is only part of an electoral strategy to gain support for next year’s middle-term election from growing middle-classes living in the capital of the country. Mexico City is in fact PRD’s main political bastion and it turns out that PRD has two serious contenders to the 2018 presidential election, Marcelo Ebrard and Miguel Mancera, the former and the current governors of Mexico City…. To read the executive summary of the second State of the Union click here, for the statistical data appendix click here and for the full version and broadcasting video click here. * This social program was created in the late 1980s by President Carlos Salinas de Gortari under the name of Solidaridad. Then it was change to Pogresa by President Ernesto Zedillo and finally into Oportunidades under PAN governments. .
Last week, the House of Representatives approved the last set of regulations of the telecommunications reform launched by President Enrique Peña Nieto. This law is only part of structural changes that the current administration started in 2013. In recent visits to Mexico, the Managing Director of the IMF, Ms Christine Lagarde and the Secretary General of the OECD, Mr. Jose Angel Gurria praised the initiatives started by President Peña Nieto, with the support of the Pacto por México coalition (see previous post). Both representatives agreed that this will transform Mexico’s economy and will improve living standards in the medium term. The main objective of the reform is to foster fair competition and to increase the productivity of the Mexican industry, especially of micro, small and medium enterprises (SMEs). According to the 2009 economic census (INEGI), SMEs represent 98% of the economic units, produce 52% of GDP and employ 72% of labour force in the country. This means that SMEs are the corner stone of the Mexican economy and therefore it is vital for the country to create conducive conditions for SMEs to flourish. In practical terms, the telecommunications reforms seeks to lower prices and increase quality and coverage of services. The Senate passed the bill on the 4 July, while the House of Representatives ratified it on the 8 of July. In both chambers, PRD vote against it. Critics argue that there was not any real debate and that there are major gaps in the regulation. It is believed that major corporations were able to protect their interests and that is why the law took more than eight months to be finalised. However, the strength of the reform is that it is embedded article 6 of the National Constitution, which related to the freedom of speech. While there are many other elements that can be highlighted, for those who have lived in Mexico would agree that these are significant steps that if fully implemented will bring large benefits to telecommunications users. So here are only a few of the practical aspects of the reform, but as experts would notice the extent and technical details of the reform are far beyond the scope of this post. To start the law establishes the Federal Institute of Telecommunications (Instituto Federal de Telecomunicaciones or IFETEL), replacing the old Federal Commission. IFETEL is an autonomous government body that will function as an anti-trust agency in the sector. Regarding phone and mobile phone services we can underline the elimination of long distance call and roaming charges, refund of fees for early termination of contracts, mobile devices will be sold unlocked, possibility for mobile phone users to transfer their number across to the carrier of their choice. As for television and radio broadcasting, there will be two new national open television broadcasters and a new state radio and television broadcaster with national coverage and private televisions (pay TV) will be able to telecast free-to-air television for free. Moreover, parental services will be implemented to restrict adult content to young users, any discrimination based on gender or race will be monitored and sanctioned, access to people with disabilities will be enhanced and illegal use of personal data will be strictly penalised. For further details see here. The success of the reform is still to be seen. Mexico’s telecommunication sector is dominated by few powerful actors, so the challenge for Peña Nieto administration is to actually ensure that the telecoms law is fully implemented and that hegemonic competitors are dismantled to allow fair competition in the sector. Nevertheless, right after the approval, telecommunications mogul Carlos Slim, unexpectedly announced that he will sell part of its business. It seems perhaps that dominant players are one step ahead of the game. 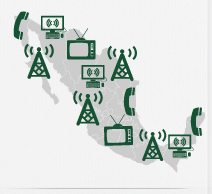 Will the new IFETEL (and Peña Nieto’s government) be up to the test? The full text of the telecoms reform can be accessed here (Spanish version only). A few days ago, Forbes magazine released the 2014 list of World’s billionaires. Seven Latin American billionaires made the top 100, with Mexican telecom tycoon Carlos Slim, in the second spot. In total, there are almost 100 billionaires in the continent and their combined fortunes add up to US$500 billion. But on the other hand, Latin America is still home of 160 million of poor, equivalent to 35% of the population in the region (World Bank data), despite intense governmental efforts to reduce poverty. Furthermore, the OECD in the report How’s life in 2013 noted that countries, such as Mexico and Chile are way below the OECD average of GDP per capita and gini coefficient. However, the report also mentions that despite economic difficulties faced by the population, Brazil, Mexico and Chile have higher spreads of life satisfaction. In fact, out of range from 1 to 10, Mexico scored 7.3, Brazil got 6.7 and Chile scored 6.5 just below the 6.6 OECD average score. The How’s life in 2013 report shows a new approach to quantify and understand poverty. At first well-being of population was measured only on the basis of material resources reflected on the GDP per capita. In the early 1990s, the UNDP Human Development Index (HDI) incorporated health and education. Today, several countries are shifting to more comprehensive forms of measurement. This new methodology seems to take on board the approach based on capabilities (functionings) that Amartya Sen fiercely defended. In 2008, Mexico started using this method in its poverty measurements and included six basic social rights in the Law for Social Development. Also, Colombia, El Salvador and the Brazilian state of Minas Gerais have included multidimensional approaches to measure poverty. These governments sought to a better assessment of the capabilities and potential of citizens. But what exactly is a multidimensional approach of poverty? Poverty itself has several aspects. Poverty measurements should include elements that could cause or further increase the situation of deprivation populations. El Salvador, for instance, identified eight dimensions to be observed and addressed as part of its poverty measurements: employment, housing, education, security, recreation, health, nutrition and income. Colombia chose to evaluate social and health conditions by measuring the following five conditions: education, childhood and youth, labour, health and access to household utilities. While Mexico selected educational, access to healthcare, social security, housing quality, access to basic services and nourishment. In turn, based on these elements the Mexican government classified deprivation in three categories: 1) food insecurity (extreme poverty), 2) obstacles to development of capabilities (access to education and health) and 3) material deprivation (access to adequate housing and transport). This trend is not unique to Latin America; Bhutan, Malaysia and some areas in China have also adopted it. The most commonly known is the Gross National Happiness Index of Bhutan that includes nine dimensions. The importance of a multidimensional poverty approach is based in the fact that it highlights aspects that are lagging behind and that require intervention. In other words, by having measurements of different dimensions of deprivation, decision-makers are able to identify elements that need immediate attention of public policies. Policy-makers can also observe progress of social policies and can reassess the continuation or reformulation of current strategies. While developing countries have made significant efforts to better understand and find solutions to address poverty, results are meager and governments still face enormous challenges. The multidimensional index is a photographic representation of the reality of poverty. To change the socio-economic landscape of the continent of contrasts, coordinated public and private efforts, along with civil society engagement, are in most need to eradicate poverty and reduce inequality. LESSONS FROM MEXICAN ECONOMIC REFORMS. John Kehoe, from the Australian Financial Review, published today an op-ed on the economic reforms undertaken by Mexican President Peña Nieto. Kehoe highlights the political agreement reached among the three major parties (PRI, PAN, PRD) that have enable the current administration to pass the much needed reforms (previous post). Despite outstanding challenges to overcome, such as violence and corruption, Mexico earned ‘A’ grade sovereign rate from Moody’s credit rating agency as a result of such reforms. Kehoe further notes Australian Treasurer Joe Hockey comments, on Mexico’s efforts to undertake domestic reforms to cope with global volatility. Last weekend in Sydney, G20 Finance Ministers and Central Bank Governors committed to promote a resilient financial system and to foster a conducive investment environment. The author concludes that Mexico, along with other developing countries, is in a much better position to fulfill the G20 commitments. Mexico’s President Enrique Peña Nieto (EPN) used his first state-of-the-nation address to present the achievements of the government during the first few months of his mandate. He praised the members of parliament for their support and diligent approval of the reforms that his administration launched. He emphasised the importance of setting the basis to end the inertia and transform Mexico in the great nation that it is. Peña Nieto and his supporters believe that Mexico has the potential to improve in few years the quality of life of all Mexicans. The Mexican President enounced the outcomes and progress in each of the five axes of the National Plan for Development 2013-2018 (launched at the beginning of his term in office): 1) Mexico in peace; 2) social inclusion; 3) education with quality; 4) economic prosperity; and 5) Mexico as a responsible global actor. Firstly, he highlighted the decrease on the number of murders, the improved coordination between the law enforcement agencies and the reform of the judicial system. Then, Peña Nieto described the results of social programs, especially the National Crusade against Hunger, the expansion of Oportunidades and the addition of scholarships in the program and the inclusion of gender perspective in all government programs. In terms of education, the Mexican President affirmed that the education reform will produce better facilities, better teachers, better access to computers, internet and teaching technologies and improved facilities for students. Moreover, he pointed out that the constitutional reforms proposed by his government aim to improve productivity, promote economic growth and create jobs. The current administration considers that it is necessary to lay the legal and institutional foundations that will support the country’s sustainable growth in following decades. In this regard, the private sector commended the government’s actions and noted that benefits from macroeconomic stability are already showing; for instance, Mexico climbed to the 7th position as recipient of foreign direct investment (FDI), only in the first semester of 2013 Mexico received USD$24 million on FDI. The chair of COPARMEX (Mexican Patron’s Confederation) indicated that even when the government has promoted larger efforts against organised crime, it is still necessary to offer more certainty to investors. Great speculation emerged after the announcement of the energy reform. PEMEX (Petróleos Mexicanos, state-owned oil company) is a symbol of pride and any discussion around it touches the deepest fibres of Mexican nationalism, but the company has become so obsolete and inefficient that its production is constantly decreasing. Without private investment PEMEX is incapable to exploit the rich oil and gas reserves that the country owns. Foreign companies warmly welcomed the reform, since it represents great investment opportunities; for the US, especially, could mean less dependency on OPEC countries supply and therefore less leverage for the cartel. But in the domestic realm, private foreign investment has brought a big debate; detractors believe that it will put the nation’s wealth in the hands of imperialists interests and only very few will see the benefits. Cuauhtémoc Cárdenas (leader of leftist party PRD) and Andrés Manuel López Obrador (AMLO, leader of leftist movement MORENA) have separately called for massive public protests against the reform. Additionally to the energy sector, Mexico needs to reform the tax system. This will not only decrease the burden on PEMEX, but also will bring sounder fiscal policies, transparency and greater competitiveness to private companies. Among OECD members, Mexico is the country with the smallest proportion of tax collection (it is equivalent to only 10% of GDP, while the average is 25%). Additionally, Peña Nieto announced that in brief his government will submit to Congress a proposal to reform the financial system, which will intend to make funding cheaper and more accessible for micro, small and medium enterprises. This set of structural reforms is designed to create the conditions for a more competitive, productive and dynamic economic environment that attracts larger sums of foreign investment and encourages the creation of more jobs. 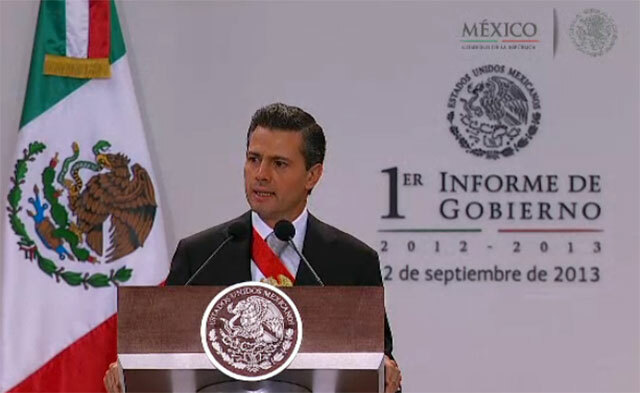 Finally, EPN mentioned that Mexico has promoted closer and deeper bonds with its neighbours. With the US, the Mexican government established an integral agenda with the aim to create the most productive region of the world. In the southern border, Mexico finalised a free trade agreement (TLC Unico) with Costa Rica, El Salvador, Guatemala, Honduras and Nicaragua and it is negotiating another one with Panama. Although, Peña Nieto’s administration is promoting more exchanges with Asia-Pacifico and his government wants to encourage larger integration of the Pacific Alliance (Chile, Colombia, Mexico and Peru) and the TPP to take advantage of synergies across the Pacific, its closer neighbours are the main focus of its foreign policy. Denise Dresser and Lorenzo Meyer, political analysts, commented that Peña Nieto had opened too many fronts with the series of constitutional reforms promoted in Congress. The analysts gave particular attention to the impact of the energy sector reform on PEMEX and CFE (state-owned enterprises for oil and electricity production and distribution), as well as, on the state revenue. It is still necessary to pass complementary bills and then to implement them all, which in reality will take quite a few years to produce results and to spill the benefits down to the masses. To sum up, Peña Nieto presented a large number of actions initiated by his government, but the results are still to be produced…. Will Peña Nieto’s have sufficient political leverage to achieve these objectives? Will the Pacto por Mexico coalition hold together for the next five years? It seems that the honeymoon is over. If you wish to consult the full state-of-the -nation document, please click here.